We don’t have to go very far into Sandra Hirsh’s newly-released anthology Information Services Today: An Introduction to reach the first of the challenges many of us face in the contemporary workplace, where job descriptions and workplace responsibilities evolve and increase at a dizzying, overwhelming pace : our language has not been keeping up with the changes taking place within our professions. It’s not as if the words “librarian” or “library” are in any danger of disappearing anytime soon; they do, at significant levels, remain evocative, familiar, and comforting even though they inadequately describe the people and the organizations under discussion. On the other hand, we see throughout Information Services Today the use of “information professionals” and “information organizations” (defined at the beginning of the book’s preface as “all places that manage, create, store, or provide information”) as terms more suggestive and reflective of what those organizations and those people who staff them offer to members of the onsite and extensive online communities they serve. This challenge of deciding what to call ourselves clearly isn’t new for any of us involved in training-teaching-learning—an endeavor that is a core part of what many library staff members/information professionals do every day. Four years ago, Lori Reed and I (in our book Workplace Learning & Leadership) were already documenting some of many terms being applied to those of us involved in training-teaching-learning just in libraries and nonprofit settings: “…director, volunteer services and staff training; training coordinator; training and development manager; training manager; training officer; chief learning officer; learning and development coordinator; staff development and training coordinator; staff development librarian; staff development manager; continuing education coordinator; learning manager; and organizational development manager.” The situation has only become more challenging as our ASTD (American Society for Training & Development) colleagues began the process (in 2014) of changing the organization’s name to ATD (the Association for Talent Development) and replacing “workplace learning and performance” with “talent development” to reflect the idea that “talent development” is the overall, far-more-nuanced description of what our efforts are designed to offer and foster. 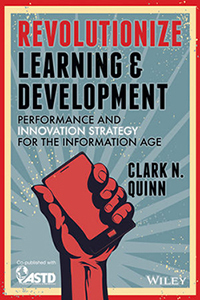 As we read through the 39 chapters provided written by a large group of information professionals for inclusion in Information Services Today, we gain an understanding of the magnificent range of services and resources information professionals provide through information organizations. And, in the process of absorbing that content, we gain a better understanding of why it’s worth looking for alternatives to “library,” “librarian,” “library patron,” and “trainer” within the dynamic and enticing worlds we are lucky enough to inhabit, foster, and support. Connections between librarianship, training-teaching-learning, innovation, and leadership continue to become increasingly obvious as we move further into R. David Lankes’s “New Librarianship Master Class”—a massive open online course (MOOC) under the auspices of the University of Syracuse School of Information Studies— and further into his book The Atlas of New Librarianship. 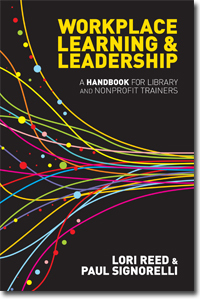 It’s that huge theme that Lori Reed and I explored in our ALA Editions book Workplace Learning & Leadership: A Handbook for Library and Nonprofit Trainers, in which we proposed that all trainer-teacher-learners need to be taking leadership roles in the organizations and communities they serve. It’s a theme that colleagues and I continue to explore when we have face-to-face and online conversations. And it’s a theme that provides stronger foundations for the suggestion that library staff and others working in training-teaching-learning might even more effectively contribute to strengthening the communities we serve if we find ways to collaborate more regularly regardless of the type of organization we serve. He reminds us that the places in which we work, those places we provide (onsite and online libraries for libraries, any learning space in my extended view of what Lankes so aptly documents), “are places of constant learning and therefore constant change….Learning is change…[so] we must be constantly changing.” And leadership, he maintains, is part of the equation. This is far from a utopian cry for ill-defined results. In connecting these assertions to a broader goal of “improving society,” Lankes helps us see that if we are focused and successful with our efforts, we are contributing to meeting an essential need within the individual communities and larger society we serve: facilitating the conversations and other learning opportunities that strengthen communities. It comes back to a theme running through the course and the book: we can make substantial positive contributions if we are part of the conversations taking place and affecting our communities, and if we are helping to facilitate positive change through implementation of the mission statement Lankes consistently promotes: “The Mission of Librarians is to Improve Society through Facilitating Knowledge Creation in their Communities”—a mission statement that can equally be applied to any trainer-teacher-learners and, again, that begs for collaborations between anyone involved in those endeavors within or outside of libraries. Lankes does a wonderful job at emphasizing the importance of what we do collectively: “We can’t have one person in charge of innovation. Everyone must be in charge of it,” he reminds us, and I would extend that statement to say the same of leadership, of training-teaching-learning, and of the social media tools that so many of us are using to facilitate the conversations Lankes is promoting. “Librarians are radical positive change agents,” he reminds us, just as any trainer-teacher-learner is a radical change agent—and the best are the ones who are not rolling out the same lesson plans year after year, or avoiding opportunities for innovation not only at the large-scale level that generally comes to mind when we talk about innovation, but also at the small, personal levels that each of us has the possibility of pursuing—if we view ourselves as potential positive change agents who must assume leadership roles whenever we can. And if all of us take the time to read The Atlas or view some of those wonderful lectures that will remain online long after the current course formally ends, we might be inspired to make magnificent strides for our communities, the organizations and clients we serve, our learners, and ourselves simply by reaching across the aisle and embracing collaborative opportunities with other trainer-teacher-learners with whom we haven’t yet collaborated. N.B. : This is the sixth in a series of posts inspired by the New Librarianship MOOC. Many of us who write or who spend time with writers are no longer naïve enough to think that it would be wonderful to meet every writer we have ever admired; writers—like anyone else—can be absolutely insufferable when given the opportunity to be full of themselves/ourselves. But when we manage to set our overinflated egos aside for at least a few minutes and listen more than talk, we discover the pleasures of being part of the formal and informal communities we create. It has been several years since I was briefly and pleasurably part of the Squaw Valley Community of Writers and a smaller fiction-writing group, but I’ve never been far removed from writers as colleagues, friends, and mentors—and yes, in some cases, tormentors. As is the case with so many other communities of interest, formal and informal communities of writers can often be the only means we have of sustaining our creative processes when long hours, days, weeks, or even months of effort seem to produce little of consequence for us or for our readers. Meeting a variety of first-rate writers promoting their new releases, further marketing the book Lori Reed and I co-wrote last year (Workplace Learning & Leadership), and attending a reception for writers united under a single publishing house (ALA Editions) at the 2012 American Library Association (ALA) Annual Conference last month provided yet another reminder of how important these communities can be for those whose work is largely completed in long stretches of solitary effort. And how far-reaching our connections are even when we do not clearly see them. At the heart of the reception was ALA Editions’ right-on-target goal of formally and cordially welcoming authors from Neal-Schuman to the ALA Editions stable of writers after ALA Editions acquired Neal-Schuman. More importantly, however, it provided an opportunity for writers and others associated with both publishing houses to sit together, share ideas, and look for the creative opportunities that our unanticipated connections might provide. It doesn’t take long, when walking into the sort of small and intimate setting ALA Editions provided that evening, to recognize familiar faces: staff from the publishing house; colleagues associated with ALA Editions; and even a few from the latest addition to the ALA family. But the real fun began as we occasionally lined up to retrieve a beverage or small plate of hors d’oeuvres and play the read-that-nametag game to match familiar names with unfamiliar faces. The winning moment came for me when I looked up from a name tag and found myself unexpectedly eyeball to eyeball with a writer—Esther Grassian—whose work influenced me tremendously while I was earning a Master’s degree and focusing on online learning a few years ago. Because it was an article she co-wrote (“Stumbling, Bumbling, Teleporting, and Flying…Librarian Avatars in Second Life”) that had attracted my attention as a student, I had no idea she also had co-authored two Neal-Schuman books with Joan Kaplowitz and would, therefore, be at the reception. Having met plenty of colleagues who write, I’m far from star struck when I meet a writer whose work I admire—OK, OK, let’s be honest: I’m always star struck when I meet someone whose work I admire, but I was trying (probably unsuccessfully) to not let it show in a setting where Grassian and I were ostensibly colleagues rather than writer-admirer. She was gracious enough to sit with me and a few of the other attendees as we discussed our work, what we are doing, and what we hope to be doing over the next couple of years. And the magic continued as various people one or the other of us knew joined us at that table and become part of a brief and pleasurable evening when we could learn from each other. Consider possibilities none of us might have stumbled upon without those exchanges. And celebrate the wonderfully sustaining power of communities of writing. Although I was more intensely engaged in the twitterverse than ever before while attending the 2012 American Library Association (ALA) Annual Conference this week in Anaheim, I was surprised to find that at some levels it was a far different experience that participating in the recent American Society for Training & Development (ASTD) International Conference & Exposition Twitter backchannel. Both conferences had streams of tweets that were virtually impossible to completely follow; there was simply too much content for anyone to absorb. And I was relieved to hear an ALA colleague who was dedicated to keeping up with it finally admit, halfway through the conference, that even she was overwhelmed by the magnitude of the flow. Both conferences also had a core group of tweeters who recorded and disseminated information about what was happening in conference sessions. But one thing that was distinctly different between the two conferences was that ASTD members who were prolific at tweeting were capturing content from a teaching-training-learning point of view—live-tweeting from sessions to share information that the rest of us could later incorporate into our own workplace learning and performance (staff training) endeavors—while many of the more frequent conference attendees who were tweeting in Anaheim were producing a combination of personal tips about where to find the best conference freebies; sightings of keynote speakers and other celebrities onsite for conference events; personal observations about the experience of attending a conference with more than 20,000 other people; or, at an extreme edge of the backchannel, an overtly snarky set of observations—sometimes live and from sessions where the subjects of their criticisms were in the front of a workshop room or on stage in a crowded auditorium. Fortunately for those tweeters, none of their targets seemed aware of or inclined to respond to those criticisms in the moment as happened in a situation described by Cliff Atkinson in his book The Backchannel. Anyone inclined to think the comparison between the two groups of backchannel contributors is unfair or an apples-and-oranges sort of effort needs to remember that members of library staff are increasingly finding themselves in the role of trainer-teacher-learner as a core part of their responsibilities to those they serve, as Lori Reed and I document in Workplace Learning & Leadership. Members of library staff also need to be as up-to-date in their knowledge of tech tools as workplace learning and performance practitioners need to be—yet there were signs at the ALA conference that we’re somewhat behind others in our acceptance, use, and promotion of those tools. When Sharon Morris and I introduced a live Twitter feed via TweetChat into our “Ignite, Interact, and Engage: Maximizing the Learning Outcome” session at the conference, for example, one of the first tweets to go out from a session participant was one of amazement (and, we hoped, happiness) that we were encouraging our learners to incorporate Twitter into that learning experience. There were signs elsewhere at the conference that others were not at all pleased by the presence of a Twitter backchannel and the use of the mobile devices that connect so many of us and those we serve without regard to geographic barriers. One conference attendee noted, via Twitter, that someone had yelled at him for tweeting, and another attendee reported via Twitter that she was told she shouldn’t be using her iPad during a general-assembly keynote presentation. It’s obvious that we’re still very much in a state of transition in terms of how we use and accept the use of Twitter, backchannels, and tech tools in public settings. And I firmly believe we need to develop a better sense of etiquette—perhaps along the lines of something I usually do: asking those around me if my use of a laptop or mobile device to capture session notes and share them with others via Twitter will disturb them. I’ve never had a colleague turn me down, and only had one presenter—one who was going to give a presentation on e-learning best practices in a venue far removed from the ALA conference—defer. Discussing this with a colleague at the conference, I found myself in the strange position of actually speaking up in favor of the tweeters—strange because, five years ago, I really didn’t want a cell phone or a laptop or anything else that I perceived as a burden/distraction rather than a resource, and I had little experience with social media tools. But colleagues, friends, and outright necessity have completely reversed my thinking, and I don’t believe it’s an understatement to say that those of us involved in training-teaching-learning—workplace learning and performance practitioners, library staff members, people involved in customer service in an onsite-online world, and many others—really can’t afford to overlook these resources if we want to be competitive and effective in meeting the requirements of our work. My colleague’s observations about the conflicts between those using Twitter and mobile devices and those distracted by or resentful of the presence and use of tech tools and resources produced an interesting exchange. Perhaps, she suggested, we could resolve the conflicts by setting aside a special area during keynote addresses and smaller workshops for those who want to tweet. Perhaps, I responded, we could set aside a special area for those who want to be free of the presence of mobile devices and tweeters. For in an onsite-online world where the majority of those we serve actually appear to be ahead of us in their acceptance and use of Twitter and mobile devices, we might as well intellectually as well as physically make a clear and visible statement about where we stand in terms of meeting them where they are and prefer to be met—as unobtrusively, civilly, and respectfully as possible. N.B. : To hear an extended (45-minute) conversation on the topic of Twitter as a learning tool at conferences, please listen to T is for Training Episode 101, “Instant Professional Development,” hosted by Maurice Coleman on June 28, 2012. 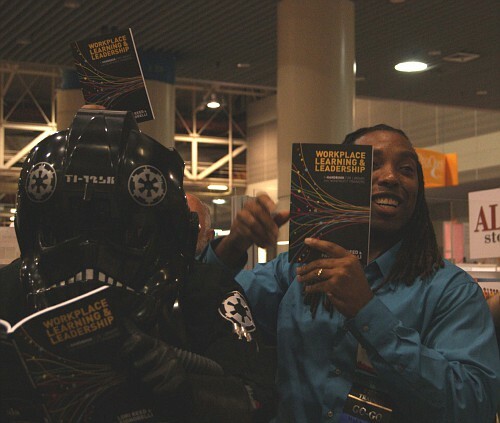 Like any authors with a newly published book, Lori Reed and I were hoping that we wouldn’t be the only ones attending our first official book signing for Workplace Learning and Leadership. We needn’t have worried. There were moments when we could simply lean back, look at the stacks of books before us, and relish the confirmation that two years of work was now out of our hands and moving into the hands of others. But those moments did not last very long. Particularly as the evening was drawing to a close. Lori and I looked up at the same time and were shocked as well as delighted to see a small crowd slowly walking past the book store—because this wasn’t just any crowd. There was an Imperial Storm Trooper. And Darth Vader was there. And a young woman in a very tight-fitting shirt that didn’t seem to have much to do with any of the movies but certainly was attracting more than her fair share of attention. My kids are going to kill me if I don’t get a picture of myself with Darth Vader, Lori thought as soon as she realized what was passing by. I’m going to kill myself if I don’t find a way to get them to join this book-signing, I was thinking. So I leapt out of my chair. Ran out of the shop. Caught up to the group. Told them that we were signing copies of our book. And asked them whether they would join us for a few minutes. “Of course,” they quickly replied, and the area was instantly transformed. “You willing to hold these?” I asked as I put copies in their hands without waiting for a response. As quickly as it started, it came to an end. We started to put the books away. I wandered away for a moment to check out that Curious George book. 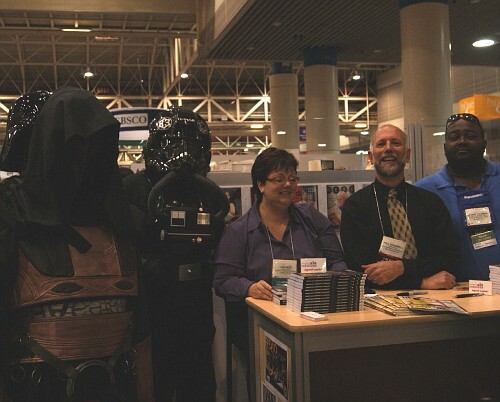 One of our colleagues at ALA Editions confirmed for me that we had managed to stage the first-ever ALA Editions book signing featuring the presence of Darth Vader. And now we’re wondering how we’re going to top that event tomorrow (Sunday) afternoon from 1:30 – 3:30 pm in Conference Center rooms 346-347 as part of the ALA Learning Round Table’s annual Training Showcase when we once again sign books. Anyone have Harry Potter’s cell phone number? Or at least a spare owl? –N.B. : Thanks to the Louisiana Chapters of both Star Wars Groups—the 501 (Empire) and the Rebel Legion—who, in coordination with Dark Horse Comics, provided the photograph by Samantha Hallenus and the entourage. More pictures are available at http://public.fotki.com/shallenus/ala-troop-nocc/page3.html.